← When the basil whispered to the tomato, it said soup. Varuval is a Tamil word that conjures up a whole genre of scrumptious fried food both vegetarian and non-vegetarian. Sunday lunches at my parents home often featured a varuval – Yera (Prawn) Varuval, Swara (Shark) Varuval, Meen (Fish) Varuval and Kari (lamb) Varuval were staples. Even vegetarian fare is way more fun as a Varuval (pronounced Vuroovul) than a Poriyal which typically involves sauteed and steamed food. The memory of mom’s unforgettable Karnakezhangu (Yam) Varuval will send me into deep depression knowing I have to fly half way around the world to taste it again. This dill, lamb and potato varuval is a particular favorite of my father’s and Sammie lists it in his top 5 lamb dishes. Having heard that it’s on my father’s fave list might have biased him just a little bit. There’s a vegetarian version that simply skips the lamb. This lamb varuval is cooked in two stages, first the lamb is pressure cooked until it is close to being done then we bring the dill and potato in for the final frying session. A wide, thick bottomed pan with an air tight light is a good substitute although the cooking time is a bit longer than in a pressure cooker. Never leave a Varuval unattended especially during the latter half of the final frying. Patience is a virtue with a varuval, the lower the heat and the longer you can stand all that stirring every few minutes the better your varuval. Add a tablespoon of oil to your pressure cooker or pan, over medium heat and toss in cinnamon and clove let them splutter for a couple of seconds. Add chopped onion and cook until translucent. Add lamb followed by turmeric powder and cook stirring until the meat starts to brown. Add ginger and garlic paste, turn the heat down a notch to avoid burning the spices, cook stirring for 2 – 3 minutes. Add cayenne, coriander powder and salt, continue to stir until the raw smell of the spices has morphed into a more cooked smell. About 3 -5 minutes. 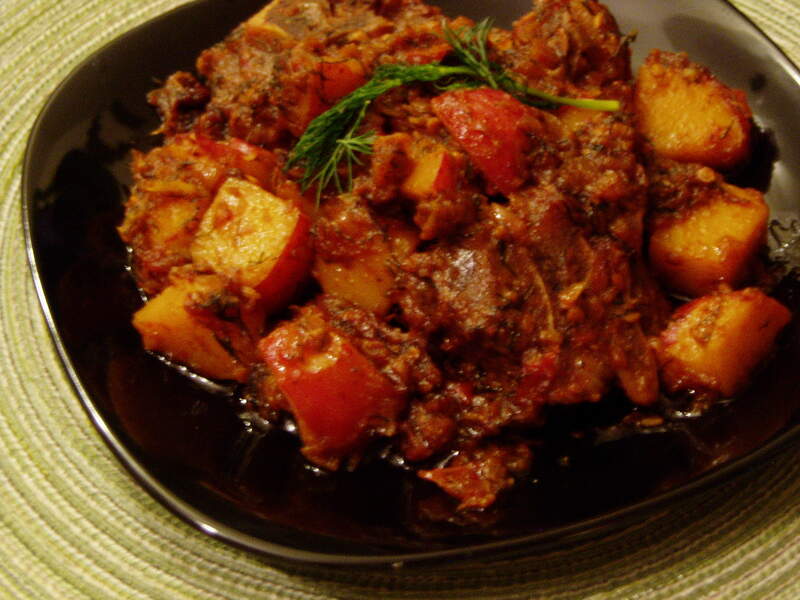 Reserve half a chopped tomato and add the rest to the lamb and cook stirring until the tomatoes break down a little. Add a cup of water and close the pressure cooker. I’ve never timed my pressure cooker, I hear the steam hissing and know it’s ready. I believe it takes 10 minutes. I also want the meat 85 – 90% done and not all the way cooked. If cooking in a pan add two cups of boiling water, cover it with an air tight lid and turn the heat down to medium. Also check periodically to ensure it doesn’t dry out and has enough water to cook. Let it cook until the meat is almost done, about 25 – 30 minutes. Once the lamb is ready, add the remaining oil to a thick bottomed pan, turn the heat to medium high. Once the oil has warmed up add fennel seeds and allow them to splutter follow with the chopped dill and cook stirring for 2 -3 minutes until all the dill has turned a darker green. Pour in the cooked lamb stir in the potatoes, turn the heat down and cook until the moisture is reduced and the oil starts to separate. Stir in the rest of the tomatoes and cook for 2 – 3 minutes. Basmati rice and Sambar (South Indian Lentil dish) is our staple combo with this dill, lamb and tater fry. It can be eaten with nan, roti or kulchas available in the frozen food section or even whole wheat pita bread. If you don’t need to have your rice smothered in copious quantities of curry or gravy like I do then basmati rice by itself will do nicely. I have to second George on the oil and wine but I must add chocolate! You know, I always forget about using the pressure cooker and it’s so handy. Thanks for the reminder. I have one and a cookbook with recipes for it also. Love the look of this dish.